How this movie was never on my 1980's horror radar remains a mystery to me. Forget its low rating on IMBD. 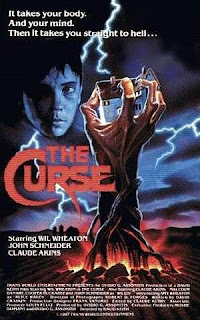 The Curse is a fun film that, somehow, I have not seen until now. Director David Keith, who is known more for his acting [An Officer and a Gentleman, U-571], does an excellent job of bringing all of the elements together to make The Curse work. First of all, he's got Will Wheaton who captured my heart as the troubled Gordie in Stand By Me (1986). He was excellent in that film and he is excellent here as a young abused farm boy who suspects something is amiss when an "asteroid" crashes nearby. Wheaton gives this character lots of emotional depth which is a rare gift for an actor his age. His counterpoint in this film is his religious zealot crazy father, played by veteran actor Claude Akins [Battle For the planet of the Apes] who has more acting credits to his name than can be mentioned here. They are great together. As an added bonus John Schneider [Bo in Dukes of Hazzard] makes an appearance as a TVA inspector who comes to the family farm to see what the fuss is all about. The other element in The Curse that is a total home run is its special effects. Sight gags and gross out moments are in ample supply. This is old-fashioned ingenuity in an age where not a lot of CGI was happening. Modern audience will find that it still looks good and has aged well. The sight of mom going full-on crazy is pure delight and the maggots spewing from a cow is laugh out loud disgusting! Hiding in the shadows of The Curse is horror legend Lucio Fulchi [City of the Living Dead, Zombi 2] who is listed as an associate producer and uncredited as a special optical effects designer. He has an artistic eye when it comes to gore and I have no doubt his input helped to make this a better film. Thankfully, The Curse is readily available for viewing on YouTube so, what are you waiting for? If you love 80's horror, you will thoroughly enjoy this somewhat forgotten gem.